New! 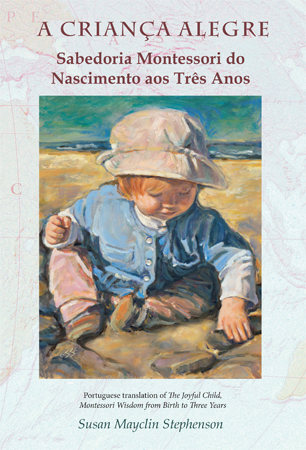 Portuguese Translation of Montessori 0-3 Book, and More . . . In 1947, forty years after the momentous discoveries in human potential that attracted worldwide attention to the San Lorenzo slums of Rome in 1947, Maria Montessori, MD, realized that to truly affect human development in the most positive way attention needed to be turned to the first three years of life. Modern scientific discoveries have backed this up, and the demand for AMI (Association Montessori Internationale) 0-3 trained adults, known as “Assistants to Infancy” far outweighs the availability. After years of guiding children, from ages two through high school, in the Montessori way, I decided to use my training and experience to provide this information in a form that would be useful not only to teachers who were unable for some reason to earn the AMI 0-3 diploma, but for parents and grandparents at home. This was first done in the pages of the Michael Olaf catalogs, and later in 3 books, full of pictures, informative captions, and simple text that makes the information available to a wide audience. The Portuguese title of The Joyful Child is “A Crianca Alegre: Montessori, do Nascimento aos Três Anos.” Early in 2014 Eva Prado and I started work on this project. This was only possible because Eva is a well-educated English teacher who had lived in the US, and with her husband had raised their son according to the ideas in the catalog text which she had years ago translated; and also because I had studied Latin, French, Spanish, and a little Portuguese. Painstakingly we figured out how to get the text to me without losing any of the diacritical marks. Over the months, chapter-by-chapter Eva translated and sent the text to me by email. And one caption, heading, and paragraph text at a time, I replaced each English section with the Portuguese. This way we were able to include all of the pictures in the original book that are so valuable to so many. Just as with the English version, A Crianca Alegre is published through Amazon as a print-to-order book. This means that there was very little financial investment because when it is ordered it is printed that night and sent the next day–very good for the trees! Bulk orders can be placed wholesale through Michael Olaf, shipped from the Amazon printer and carried in local bookstores and schools. But most importantly A Crianca Alegre is available as an Amazon kindle version, at low-cost and in some cases FREE anywhere in the world. For links see the bottom of this post. 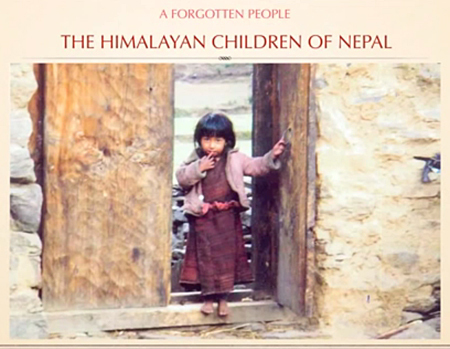 AMI organizations in Vietnam, Russia, and Mongolia are in the process of translating and will be publishing this book. I am willing to publish a Spanish edition on Amazon (after resting up from the year-long Portuguese work!). An AMI trainer and a professor she works with in Argentina have volunteered to edit and polish the book when the translation is finished. Soon I will be looking for volunteers to translate chapters. A woman in Peru is already working on the introduction. Contact me at susanonly@earthlink.net with your qualifications if you are interested. NOTE added on July 24: A “Montessori Mama” from Argenta has volunteered to translate the whole book and the work has begun! But in case she decides to share the work, interested parties can still contact me. In Orphanages: While in Morocco this year I visited an orphanage where the staff know about Montessori ideas and want to use them for the children. 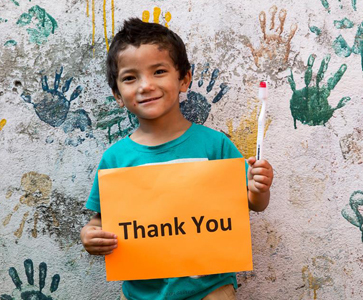 It was easy to see how just a few changes will be able to make a huge difference with the children under the age of 3 years with very little expense. See the picture above: There are mirrors but a bar is needed for the children to pull up; there is a mat on the floor for movement but proper toys are needed; there is a stairs that is presently blocked for safety, that can be used for exercising the ability to climb stairs; and there are little compartments so children can keep their shoes organized. The official Montessori work at this orphanage will hopefully begin in September. Medical Professionals: I have shared this 0-3 Assistant to Infancy information with Pediatricians and Pediatric nurses who informed me that, although they learned all about the health of the physical body in school, this Montessori information on complete development is very enriching to their work. 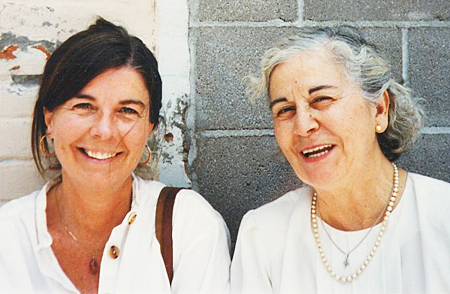 Teachers of All kinds: The 0-3 training, Assistants to Infancy—where one learns about the development of the physical body, the intellect, and the personality, and influences that will last throughout life—is considered to be extremely valuable for teachers who work with older children and adolescents. 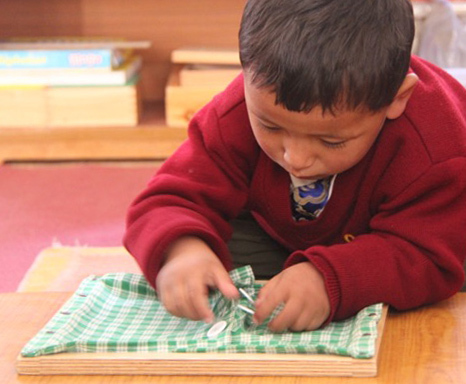 Teachers in traditional schools have gained ideas because of the Montessori practice of studying the needs of the child as well as of the curriculum to be covered. And I have heard from many people over the years that the text in the Michael Olaf catalogs (both the 0-3 and the 3-12 catalogs) were what inspired them to take Montessori teacher training. Parents: Parents have very little time these days for reading how to best support their children’s development. There are “experts” available on the internet, and in books, but none that have the international experience-based wisdom, now scientifically backed up, that I have seen in the AMI Montessori 0-3 field. Nothing that combines the meeting of the physical, mental, and emotional needs with such wisdom. I have heard over and over how even the pictures and captions in this simple book help these parents. When I first became a dad I had a lot of questions and a lot of insecurity about how to raise a son and be a good dad. At that time my wife presented me with The Joyful Child. It was a blessing! It was very useful and inspiring. I learned a lot from it and I am still learning as the time passes by. Now I know the importance to listen, understand, respect, be patient, play and read to my son. We live in a world with a lot of technology, options and opportunities, however there is still something that is very meaningful and irreplaceable, which is the time that we are willing to devote to educate and love our children. The discoveries made by Maria Montessori have completely changed the view that we have of the child and of how life develops from its very earliest moments. She not only discovered the immense inner potential hidden in this apparently tiny helpless baby, she also discovered how to help us support this potential from the beginning of life. It is important to reach expectant parents with this information at the right time so they have time to prepare themselves. It is also important to reach young adults during adolescence, when they are searching for their own potential, when they are seeking to understand their own changing bodies and minds, seeking to find out who they are and what their mission is. 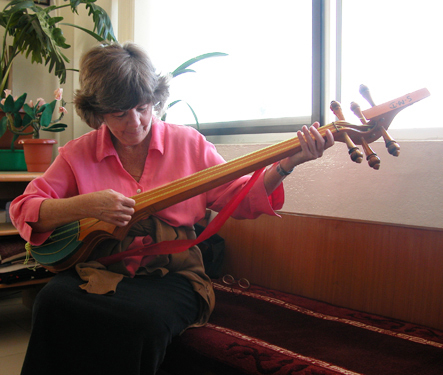 Susan Mayclin Stephenson has seen with her own eyes, over many years, that these principles succeed with children of any country, of every culture. In The Joyful Child Susan shares what we know of the child in the first three years of life in an elegant and compassionate way. I am convinced that her words will help create a better life for children all over the world. Until the book was available we shared 0-3 (and also age 3-12) Montessori information within the pages of the Michael Olaf catalogs. The catalog named “The Joyful Child” for ages 0-3 contained about one-third of the information in the book of the same name that has now been published. Over the years several people wrote for permission to translate this text into their own language and to share it. The Japanese version of Susan Stephenson’s overview of the child from birth to three, is now in its second printing. 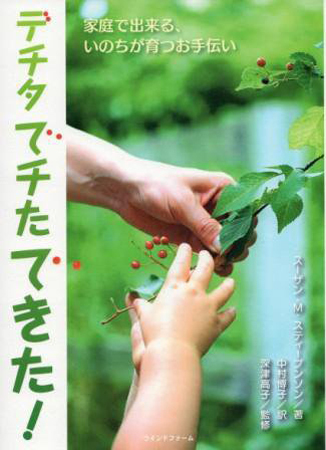 It is beautiful book with many illustrations, a best seller for Japanese parents, used as a guide for online courses. On-line “baby study groups” have been formed for Japanese families in Japan and outside of Japan, using this book as the text. Polish: When a young Polish couple were preparing for the birth of their first child they realized that translating the text was the best way to truly and deeply learn this information. Chinese: in 2003 a Chinese educator had it translated in order to inspire interest in AMI training in China. 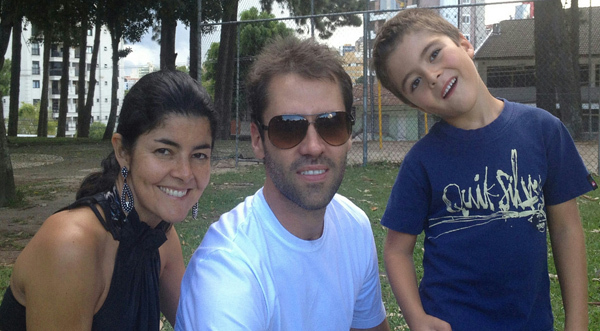 Portuguese: Eva Prado, the translator of the book, first translated this catalog text, use the information to raise her son, and has an education blog to share the information in Brazil. Arabic: an American-Palestinian family hired a translator to be able to share this information with their community in the Middle East. Russian: The Montessori School of Moscow translated the catalog text into Russian to provide for parents of the school, and to inspire 0-3 training in their country. Let us together create a better world for all, one infant at a time. Here are two of the Montessori children at the school. Several years ago (after my visit) a Montessori school administrator in Vancouver and her husband donated scholarships for two Nepali Women to train as Montessori teachers at the AMI training center, The Navadisha Montessori Foundation, in Chennai, India. Their school in Vancouver then donated materials. 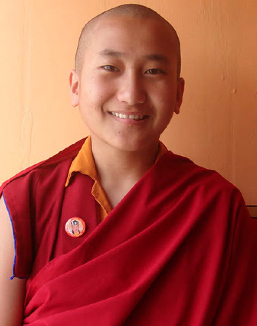 Ani (“nun”) Thinley Chokyi, who earned her diploma in Chennai, has just left the school to help her parents whose home was destroyed by the earthquake. But she has done a lot to spread the Montessori wisdom throughout the school. From the school, “She enriched our Junior Section with her knowledge and her expertise. 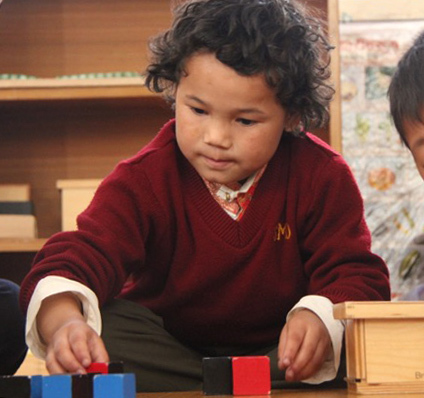 Our Nursery Class teacher, Sonam Dolma and our LKG teacher Bimala learned a lot from Ani TC and use it in their classrooms.”And with our help the Montessori work will continue. This may look like primitive conditions to many of us: very crowded bedrooms and one shower (and clothes-washing) room shared by 300 students—which means one shower a week. But compared to their village life SMD daily life and the opportunity to attend school are luxurious. When I visited the school I spent a week living and eating with the children, discussing Montessori with the heads of the school, attending classes, visiting the medical unit and interviewing newly-arrived refugees at the Tibetan Reception Center with two of the older students, and going through the “Child of the World” 3-12 Michael Olaf catalogue teaching text (now incorporated into the book: Child of the World: Montessori, Global Wisdom for Age 3-12+) with the director, pulling together information that could benefit the school. At the end of the week (It was on my birthday, October 29th. I remember because as a surprise they sang to me!) I gave a presentation to the teachers on Montessori ideas to improve the daily life and education of the children. It inspired a desire for more information on Montessori. And they try to teach me to play the tungna! No matter where in the world I work, it is as interesting to learn, as it is to teach. There is always wisdom and traditional practices of value. It is not helpful to go into a country with a “colonial” attitude that we are a superior culture (or even a superior “Montessori” educational system). 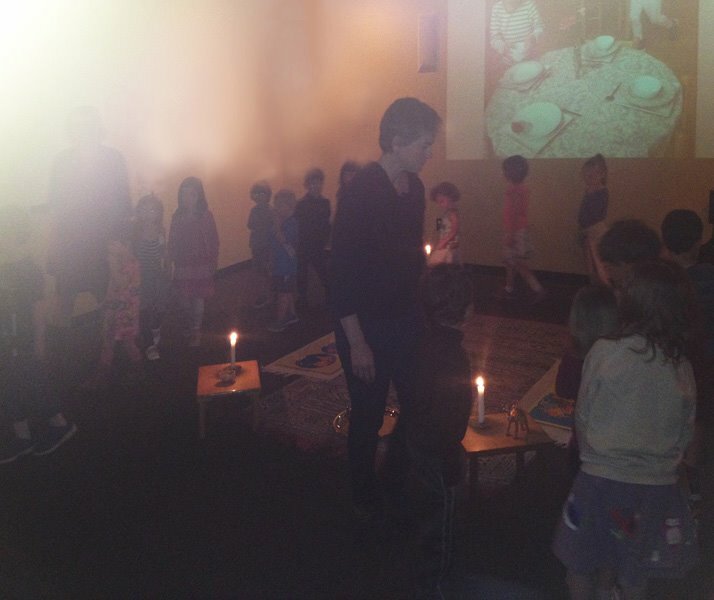 I have learned that humility is the most important trait for anyone sharing Montessori with others. 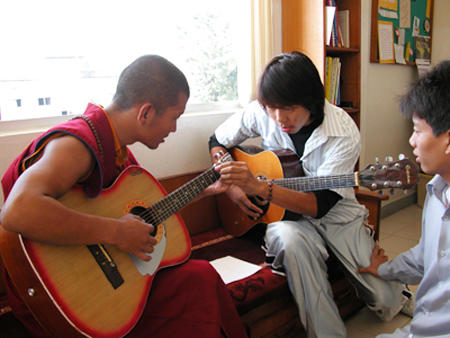 In these two pictures I am giving guitar lessons to high school students and a young monk, and they are teaching me to play the Nepalese lute, the “Tungna.” When the boys saw my respect for and interest in their music, they were far more interested in learning about mine. One of the ways Montessori children learn from an early age how much all humans have in common is through the study of the basic physical needs for food, shelter, clothing, and transportation, and how they are met depending on the environment.